Southern sophomore Phoenix Cleland dribbles left of the key, during the Lady Tornadoes setback at Eastern on Jan. 4 in Tuppers Plains, Ohio. RACINE, Ohio — Sometimes four quarters are just too many. The Southern girls basketball team led guest Belpre by seven points headed into the fourth quarter of Thursday’s Tri-Valley Conference Hocking Division tilt in Meigs County, but the Lady Golden Eagles finished the game with a 14-to-6 run and escaped with a 52-51 victory. Southern (2-9, 1-7 TVC Hocking) had five different players mark in the scoring column in the opening quarter and jolted out to a 15-9 lead. However, Belpre (8-4, 6-2) outscored the Purple and Gold by a 19-to-14 count in the second period, leaving the Lady Tornadoes with a one point, 29-28 lead at halftime. Southern poured in 16 points in the third quarter, while holding BHS to 10, to make the SHS edge 45-38 with eight minutes to play. 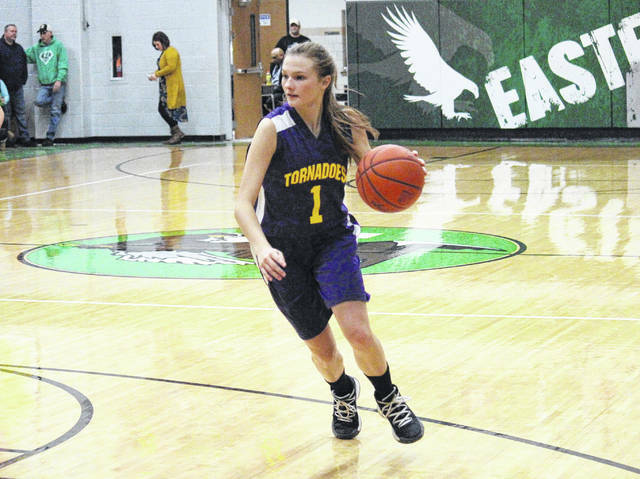 The Lady Tornadoes were held without a field goal in the finale and shot 6-of-10 from the free throw line. Belpre rallied to the 52-51 victory with 14 points on the strength of four field goals and a 5-of-6 performance from the foul line in the fourth quarter. For the game, the Purple and Gold collected 28 rebounds, while combining for seven steals, four assists and one blocked shot. Southern committed 15 turnovers in the setback. From the free throw line, Southern shot 18-of-28 (64.3 percent), while Belpre shot 14-of-24 (58.3 percent). SHS senior Josie Cundiff led the hosts with 13 points, followed by Baylee Wolfe with 12 points and six rebounds. Phoenix Cleland had nine points in the setback, Paige VanMeter added six points, while Jaiden Roberts finished with five. Shelbi Dailey, Bailee Floyd and Shelby Cleland each scored two points for the Purple and Gold. Cundiff and Phoenix Cleland both sank two three-pointers for Southern. Wolfe led SHS on the glass with six rebounds, while Phoenix Cleland paced the defense with two steals and a blocked shot. Cundiff, Roberts, Wolfe and Phoenix Cleland each marked an assist in the contest. Kyna Waderker led the Orange and Black with 15 points, followed by Kyanna Ray with 12 and Curstin Griffin with 11. Abbey LaFatch contributed nine points to the winning cause, Sydney Spencer chipped in with two points, while Lakin Hupp added one. Ray drained a game-high three triples, while Griffin hit one in the win. Southern will try to avenge this setback on Feb. 8 in Belpre. The Lady Tornadoes have a week off before returning to action on Thursday, when Miller visits Racine.